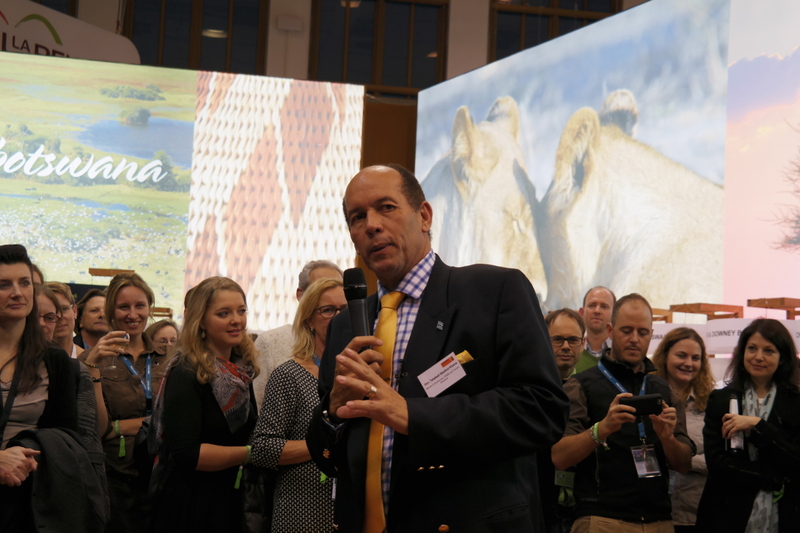 The Minister of Environment, Wildlife and Tourism Honourable Tshekedi Khama attended the 50th International Tourism Bourse (ITB) Berlin 2016 from 09th – 11th March in Germany. A total of twenty-nine Travel and Tour Operators from Botswana participated at the ITB. On 9th March 2016 Botswana was welcomed as the Official Partner Country for ITB Berlin 2017, first ever Partner Country from Southern Africa. The official announcement of the partnership between Botswana and the World’s Leading Travel Trade Show was made during the signing ceremony by Honourable Tshekedi Khama, Minister of Environment, Wildlife and Tourism of the Republic of Botswana and Dr. Christian Göke, Chief Executive Officer of Messe Berlin GmbH. The partnership will, among others, enhance international awareness of the country as an investment and tourism destination and this demonstrates Botswana’s commitment to the tourism industry as well as continued commitment to protecting the environment. Botswana’s participation at ITB continues to generate interest among the Germans and general public.